Our Produce Share Program, also known as Community Supported Agriculture (CSA), offers a relationship between the farm, the farmers, and you as a food buyer. 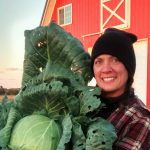 Rather than simply purchasing food, our customers become “members” of the farm who receive a portion of the farm’s harvest and have a deeper connection to the farmers who grow their food and the land on which it is grown. Our CSA is a season long commitment. We offer the opportunity to eat local, seasonal, organic food for 7 months of the year through our 2 difference CSA seasons: Summer and Autumn. Good Earth Farm’s Summer Season CSA is estimated to run for 20 weeks, from early/mid-June to mid-October. We offer several share sizes and weekly and bi-weekly options. The GEF Autumn Season CSA runs November and December and offers 4 deliveries with the option to choose either 2 or 4 deliveries. Eat local longer! Our Autumn CSA is a great way to eat locally and seasonally beyond summer! The quantity in each share varies with the seasons. Early in the season expect your share to be lighter with the vegetables of spring and early summer. By mid/late summer the summer fruiting crops appear and add more variety to the share. Autumn shares reflect what is happening in the fields, and bring root and frost hardy crops. There will be plenty of those vegetables that you are familiar with plus some that are new and unique to your table. Variety and quantity may vary as each year is different. Our Growing Practices. We are Certified Organic. We are experienced farmers, and we promise to do our best to provide you with a bountiful share each week. Sharing in the Risk of Crop Failure: The quantity of produce, however, may vary from week-to-week due to extreme weather, insects, or other production factors despite our best efforts. Sharing in the Reward of Crop Surplus: When crops are especially abundant, we pack as much as possible into your share. However, we don’t want to overwhelm our members or deliver so much produce that it goes to waste. In addition to our CSA, our farm sells to other markets, mainly to a few small independent grocery stores. Although production is not segregated, our CSA receives priority!